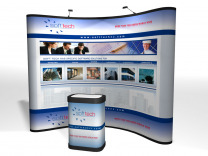 Pop up trade show displays have been and continue to be the most popular of all styles of portable show displays on the market. The pop up display industry seems to reinvent itself every few years and has continued to produce new graphic products for traditional pop up frames, which gives the overall product line a whole new lease on life. Take a look at the VBurst and Xpressions Snap products and you'll see what we mean. You Just Met the Best! 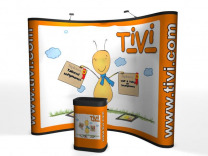 Pop Up Displays: You Get What You Pay For! 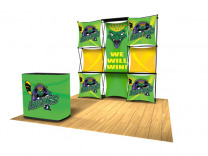 Pop Up Displays have held the top position in popularity in the category of Portable Trade Show Displays now for over 20 years, and there is little to suggest that anything is changing in the near future. Pop Up Displays continue to evolve in terms of how the trade show graphics are mounted on the frames, but the strength or weakness of the individual brands of products themselves will always be measured in the frame itself. How do you know when you have the best frame you can possibly buy? That’s actually pretty easy. Look at the metal in the framework and it will be either be a thin wall round rolled tubing, extruded round tubing, or an extruded square tubing. Round extruded tubing is good, but ask any engineer and they’ll tell you that square tubing is hands down the strongest which is what is used in the Quadro brand of pop up displays from Classic. Are there any other factors to consider? Yes, but you’ll always find them on pop ups made with the thin wall round rolled tubing. What I’m speaking of is pop ups with a myriad of small plastic pieces which over time can and will break or bend under continued use. The square tube pop up trade show booths don’t have any small parts, which is why we have always said that the lifetime warranty on the Quadro pop up is the first lifetime warranty that you’ll never need to use. It’s that good! Warranties: There are two types of warranties with Pop Up Trade Show Booths; one is no fault where the product is warranted for life because there will come a time where you will need a field repair kit, or will need to send it back to the manufacturer for repair. Our warranty on the Quadro pop up display systems is the same as the above except for the fact that we’re confident that “you’ll never need to use it.” We think our products are that good, and that our customers will prefer the latter. 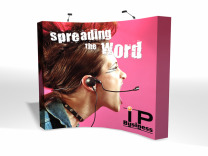 As a long time retailer of products related to trade show exhibits, ShopForExhibits has expanded their product lines to include new product offerings in the premium pop up displays line, along with additional products in the retractable banner stands line. By launching a new state of the art web site, ShopForExhibits plans to keep pace with future growth challenges by supplying prospective customers with the knowledge and product information needed to build confidence in an aggressive web retailing strategy. Faced with uncertain economic challenges, the online trade show exhibit retailers such as ShopForExhibits, are working diligently to provide not only reasonable price points for their products, but exceptional values in terms of ways of visually imaging a companies message, to quickly move prospects to buy. 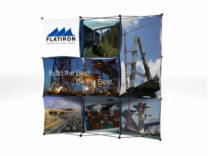 Successfully bringing new products to market such as the new tension fabric displays, isn't as easy as one would think, but due to their background with display products and internet marketing, ShopForExhibits.com has positioned themselves to lead the pack and be a successful competitor in this industry. Nothing is quite as sure as change, which is why having a trade show display supplier like Classic Exhibits has enabled so many distributors weather the difficult economic times through the development of so many new cutting edge products. How did Classic come up with the right formula for success in the wake of a down economy over the past 4 years? By careful observation of their own business over time, they became aware of the fact that certain aluminum extrusions had significantly greater value in cost per running foot of metal than other shapes, and concluded that utilizing those particular shapes in future product development could bring great returns in the marketplace. As time passed, they were able to bring to market from their original plans, an entire group of creative new trade show exhibit products with a variety of price points to appeal to a whole spectrum of custom modular hybrid display customers. You may have heard of some of the excellent new products that Classic Exhibits developed recently, beginning with the Perfect 10 and Magellan Miracle tension fabric display systems, followed up with the Sacagawea custom modular hybrid display system. At this moment, Classic is being very aggressive in the market in comparison with other producers of trade show exhibits, which has put them in a leadership position where they will be well prepared to be a market leader as they move into the future.